Allow you to easily rip DVD disc movie into any video/audio files on Mac with iMacsoft Free DVD Ripper for Mac. So professional Mac DVD Ripping software rip movie DVDs for playback on the new iPad, iPad mini, iPad 4, iPad 2, iPad, iPhone 3, iPhone 4, iPhone 5, iPhone 5S/5C, iPhone 6/6 Plus, iPod touch, iPod nano, Apple TV, PSP, PS3, etc. Rip movie DVD to any video/audio files for playback on portable devices. It can allow you to eaisly rip DVD to AVI, WMV, 3GP, MPEG-4, RM, DivX, FLV, SWF, XviD, MOV, SWF, MP4, H.264, VOB, MKV, TS, etc; Also the DVD audio can be extracted and fast rip to any audio files, such as AC3, M4A, MP3, WMA, WAV, AAC, etc.You can upload ripped files to YouTube, Google+, Facebook, Myspace of your own SNS website. How to Rip DVD to MP4 with this Free DVD Ripper for Mac? 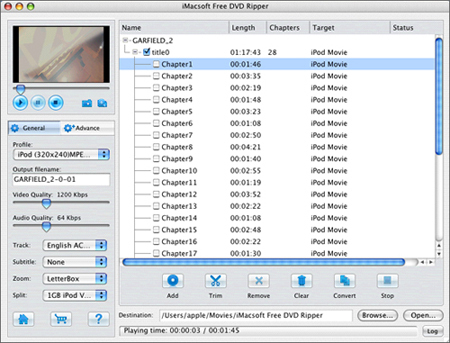 Run iMacsoft Free DVD Ripper, and click "Open DVD" button to select a DVD (or DVD Folder, ISO file, IFO file) in the dialog box that opens. 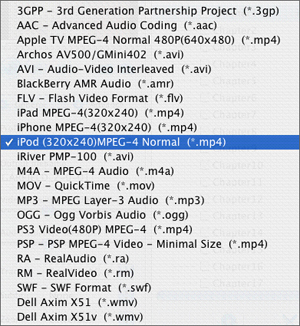 In the "General" panel in the left of this DVD Ripping program, click the "Profile" drop-down list and choose the "iPod MPEG-4 normal video (*.mp4)" option for output iPod MP4 video files. Click "Browse" button to select a destination folder in the dialog box that opens, and click "OK". After finishing the above settings, check the needed files to rip in the file list, click "Start Ripping" button on the toolbar, iMacsoft Free DVD Ripper for Mac will start ripping the selected files. You can view the progress of ripping process from the progress bar at the bottom of the window. Tip: Select a chapter or title in the file list, click "Trim" button in the toolbar to open "Video Trim" window. You can clip the original video into several parts, then convert and output them separately or as a whole one. Set start point and end point, you get the segment you want to convert and output. How to copy movie DVD to new DVD for backup on Mac? iMacsoft DVD Copy for Mac can help you copy DVD to a blank DVD for backup on Mac OS X Lion. This following guidance will show you how to take a full length movie and make a DVD copy on Mac OS X. How to convert DVD to DVD folder on your Mac hard drive? The following guide will show you how to back up DVD as DVD folder with high quality as the original ones with iMacsoft DVD Copy for Mac. How to burn ISO/DVD folder to DVD disc on Mac OS? iMacsoft DVD Copy for Mac can easily help you burn ISO/DVD folder to DVD disc on Mac. The following guide will show you how to achieve this. How to convert videos to DVD with iMacsoft DVD Creator for Mac? iMacsoft DVD Creator for Mac is a professional shared software for DVD creating, burning and converting and easy way to create your video DVD from video images and video files. How to create video folder or ISO on your Mac? With this handy Mac DVD creator and burn tool, you can combine your video files into video slideshows, and edit your video clips by video trimming and video resizing. 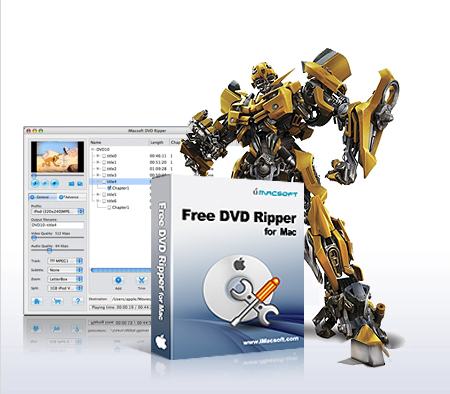 "Fully free get this powerful DVD Ripper and use it on my Mac computer, now i have ripped DVD movies into iPod library successfully. So excited. Thanks iMacsoft..
"Very satisfy with this ripping quality, and DVD quality of HD can be reserved on videos on my iPad. So professional"
©2009-2014 iMacsoft Software Studio, All rights reserved.